POSSUMS are hideous little creatures with intimidating—seemingly frightening teeth and eyes. They are pretty infamous for carrying rabies as well as behaving in a way no other animal behaves. Possums (sometimes known as opossums) are nearly the size of a cat. They are successful opportunist. Perhaps you might to learn more about possum description and how they look like. Depending on the species opossums have varied sizes and weight. Scientists believe that opossums are the most varied sized mammals. The overall body length measures around 13 – 37 inches (35 – 94 cm) including the possum’s snout. The possum’s tail adds 8.5–19 in (21.6–47 cm). Adult males weigh 1.7 to 14 lb (0.8–6.4 kg) whereas the females average 11 ounces to 8.2 lb (0.3–3.7 kg). The northern North America population is much bigger in size as compared to those inhabiting tropics. The tropical opossums are nearly 20 times less heavy than the northern opossums. Virginia opossum has 50 teeth which is the maximum number of teeth in any North American mammal. 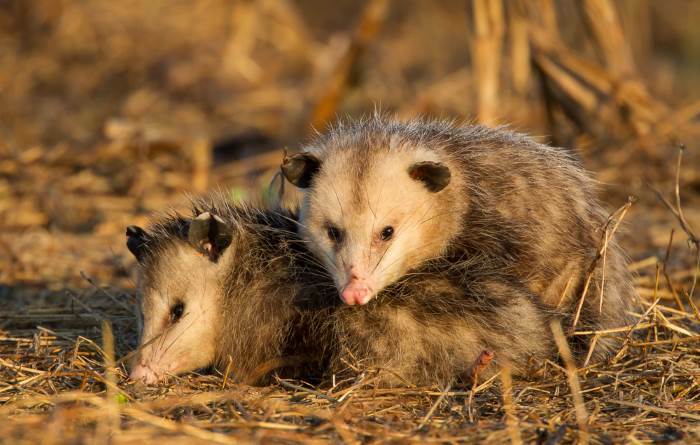 American opossums are primarily recognized by their grayish brown coat with fairly thick fur which aren’t good enough to provide them insulation. They have a long prehensile tail one that serves to balance it as the animal moves into the trees. There are no hairs on its tail. 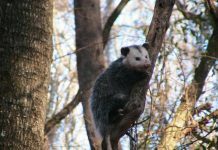 Opossums also use their tail to hold branches but they can’t hang by their tails. Possum’s long prominent snout and a flat nose add to its bizarre disposition. Opossums have 50 teeth—which is the greatest number of teeth in any North American mammal. They have claws on just about any finger. They don’t have claws on their thumbs. Opossums occasionally use their claws in digging holes or burrows. Like American opossums, Australian possums are also varied not only in sizes and weight—every species is recognized by its own physical characteristics. The color of the coat; the eyes, the snout, and the overall length varies even within the same subspecies. The common ringtail possum is mainly recognized by its reddish coat. Compared to Virginia opossum, the ringtail possum has short snout and short ears. The underside of the animal is white so as the patch behind its ears. Herbert river ringtail possum altogether displays different coat color. It has tapered tail and pointed face. 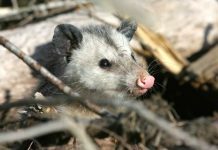 Adults are recognized by their black and white coat while young possums display pale fawn with slightly dark stripe on their heads. Common Ringtail Possum in Australia. Yet another Australian possum with greenish coat is a green ringtail possum. It has white patches under its ears and eyes. The color of the fur is green. Rock ringtail possums are predominantly greyish in color. Unlike many other possums, the rock ringtail has comparatively long woolly fur but short tail. Its coat color enables the possum to camouflage into the grey rocky background. Males are smaller than females. Males reach the length of 334 – 375 mm whereas females average 349 – 383 mm. They have 200 – 260 mm long tail. 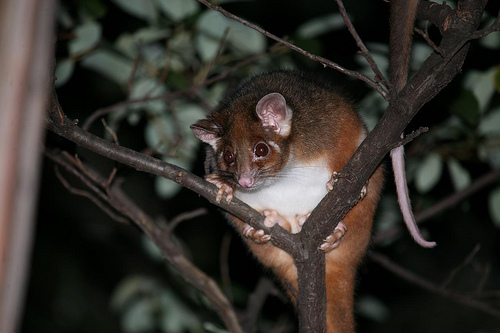 The head-body length of the common ringtail possum is about 300 to 350 mm with the tail reaching the size of its body. The ringtail’s tail averages 300 – 350 mm. They weigh around 700 – 1,100 grams. 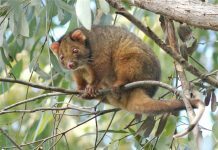 The Herbert river ringtail possum reaches the length of 300 – 375 mm with the tail measuring 300 – 395 mm. Adults weigh around 700 700 – 1,450 grams. The head-and-body length of the green ringtail measures around 340 to 380 mm with the weight averages 1037 – 1350 grams. The tail adds 310 – 330 mm to its body length. Rock ringtail possums are pretty heavier than green possums. The biggest specimen weighs as much as 2,000 grams.